OK, here’s the deal… this recipe is absolute trash. With a capital T! And you know what? I don’t feel one bit bad about it! Because sometimes it’s OK to get a little trashy! But for our Family Game Night this past Saturday, these were perfect! They’re fun, the kids can serve themselves and oh, yeah, they’re ooey-gooey mind-blowingly cheezily delicious! Brown ground beef and sausage until cooked through. Thoroughly drain pan drippings from meat. Combine browned meat, Velveeta, onion powder and black pepper in a saucepan or crock pot* and heat on low until cheese is melted and bubbly. Serve on slider buns with lots of cheap beer. *If you make this in a crock pot, switch setting to "warm" once the cheese is melted to prevent it from drying out or over-cooking. Haha, perfect name for these! No doubt these will be an instant classic! When I read the notation about heating in the crockpot, I thought, "hmmm, let it thicken and cool slightly. Then scoop it out into patties. Bread them and either deep or pan fry them." Upon hearing me utter that thought out loud, my housemate said, "Stop trying to kill me. You're not getting the house in my will." You comment cracked me up! HAHA! Wow! These look they are right up my family's alley for a weekend meal. I'm pinning this for future use. Visiting from Weekend Potluck! I used to make something like this when my kids were little. I usually add some yellow mustard to the mixture while heating it. I just stumbled upon this recipe, and I also just bought a box of Velveeta! Guess what I'm having for supper? Hanky panky, sh*t on a shingle. SH*T on a shingle is creamed chipped beef on toast! For SOS (sh*t on a shingle) we do grounded hambuger meat with a milk gravy or a ground breaksfast sausge on either bread, toast, or biscuts. Everyone does it differnt, it's all about taste. Dona Kunz is right. SOS = Creamed chipped beef on toast. Used to devour it on Sunday mornings. Just sizzle the chipped beef lightly in a little oil to bring out the flavor. Beware: chipped beef is sold now in little pre-packaged paks and is pretty pricy, or sometimes you can get it in the deli. 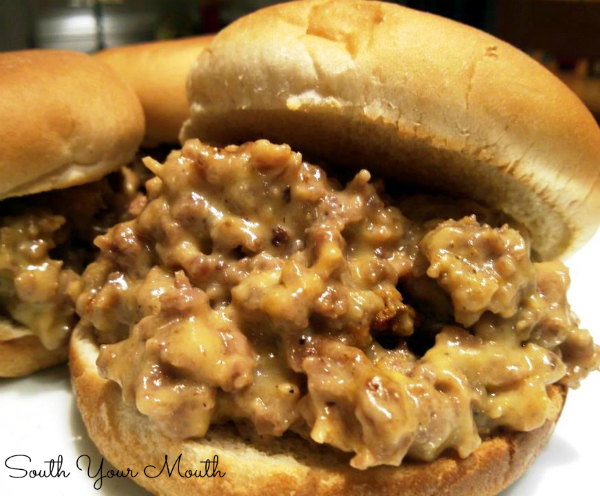 Christina Jones, you are making hamburger gravy and sausage gravy, another great meal, and both are delicious! Not sure what the recipe means by BULK SAUSAGE, does that mean breakfast sausage? YES! Sorry! I have a lot of international readers (if ya can believe that?!) and I try not to reference items that aren't sold everywhere. I think "breakfast sausage" is an American thing. Maybe. I think?? Most stores sell a product in their fresh meat areas labeled bulk sausage. It is not in a roll like Jimmy Dean. I personally think the flavor is slightly different, better, but it could just be me. Bulk sausage means sausage that is not put into casings (not into links). I don't think it has anything to do with a flavor. It just means "loose" sausage in a package, like hamburger/ground beef would be sold. Bulk sausage / hamburger is just meat sold by the pound, whatever amount you want, as in a butcher shop or at the fresh meat counter in the grocery store. if it helps, 'breakfast sausage' is simply ground pork with spices added, and not stuffed in a casing so it is more like a 'loaf' mixture than an actual sausage. I think this would be really good if you left the bun out of the equation and mixed the meat/cheese with some cooked macaroni, put into a baking dish, topped it with a bread crumb mixture and baked until bubbly. Yum! 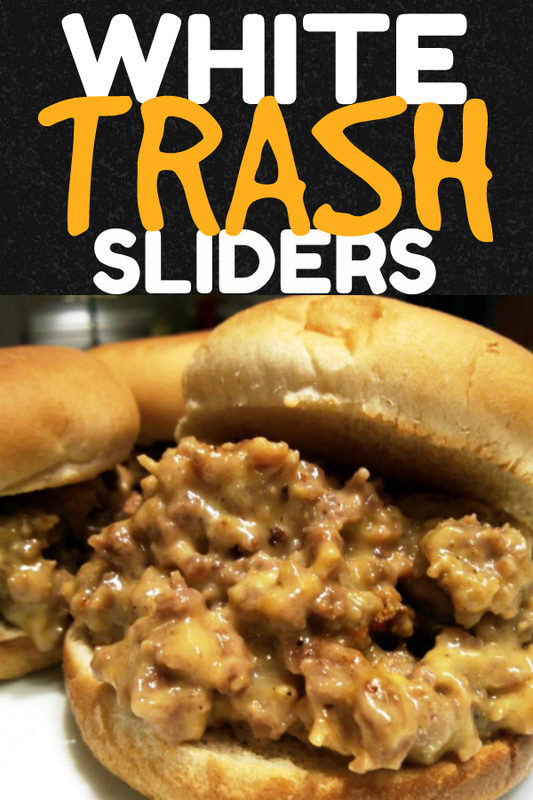 If you do this, they are no longer sliders! I make this except I add a little milk and a can of drained chopped tomatoes with chilies and use it as dip for tortilla chips, doesn't last long in my house..
OMG! These look so yummy! I want to make them but I'm doing the south beach eating plan, maybe if I replaced the sausage with turkey sausage and the bread part with something whole wheat and not only drained well, but also rinsed the meat I can have this... I'm gonna give it a go, might not be near as yummy as these look but I won't feel all that bad eating them! Thanks for sharing!!!! If you use cheddar cheese soup it tastes amazing! does this recipe make 24 sliders? I have been making these for years and have never once seen this recipe published anywhere! The only thing I do differently is spread the meat mixture on party bread and then freeze until set. Then I just put them in baggies so they are ready whenever I need to serve a little something! Men absolutely love these which makes them perfect for any football gathering! Oh and I use the hot sausage. Its just a personal preference. It makes no difference at all. Do whatever is easier to work with. I find it easier to brown one, drain and then cook the other, drain and combine, then add teh remaining ingredients but again, that is just me. I cook them both at the same time but I have a HUGE skillet that will hold everything and still let it get nice and brown. It doesn't matter - do whatever works for you! Hello Mandy! Another wonderful recipe. I added a few more spices to the mix this evening - garlic, cumin, and just enough cayenne to make you go "hmmm" without a heavy hot pepper taste. 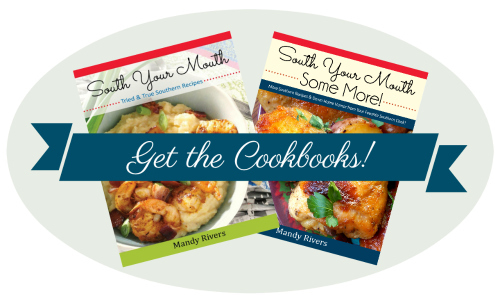 Love your blog and your recipes. Thank you for sharing and allowing us to share. :) Kim M.
We make these with a can of baked beans added and we call it Barf on a Bun. sounds the most delicious of all. the kids picked this name! read a comment above about freezing...ever frozen just beef/velveeta mixture? Planning several easy freezer meals for my teens and husband while I'm gone this summer on a trip. What do you think would be the best way to reheat? Thanks! So I just realized I picked up the wrong sausage. I thought it was breakfast sausage. I grabbed a roll of WalMart brand's new breakfast sausage with bacon in it. Think that will be ok? Sounds like it'll be yummy right? My Mom and I have been making these for 40+ years... I add oregano to the meats while frying (or I've used Italian Seasoning as well) , then spoon it onto the party rye slices. We've always called them "Pizza Snacks" .. they've always been a hit! I fry the meats together in a large electric skillet, drain, return to the skillet and add the cubed velveeta cheese and mix. If the meats are still hot , the cheese melts right into it. You can bake or I broil them right away or I make up a couple of batches and freeze them. After I put the mixture onto the bread, I leave them on cookie sheets, put them in the freezer and after a few hours , you can put them in large freezer bags and use them whenever you want. I make them for my son , very convenient for him to take a few , put them on a cookie sheet and broil until the top starts to look bubbly. And they can be frozen for a long time. Who came up with that title for the recipe? Terrible recipe name in my opinion. Lighten up - it's a fun title! The name is what caught my attention! You have at least my permission to call it anything you want, as long as you make the recipe. Look at all the variations that everyone has come up with. That's why cooking is so fun -- you can make everything as you like!!! late to the party..but comes out just fine. be sure to season it up though. It doesn't have to be made with pork. I have made these as 'kosher' with no pork. These look delicious. And I love the name! Do you have to use velveeta? thanks! I have made these for years except I put the "filling" on party rye then I freeze them and put them in large zip lock bags to keep on hand. They are ready for a party or just guest that drop by. If you have time, you can thaw or just back in teh oven. Men absolutley love these! Instead of using a skillet to fry the hamburger and sausage, I put the meat in a colander with a baking dish underneath (glass) and microwave (breaking it up halfway through with potato masher) until done. The grease drains into the dish from the colander. It saves trying to drain it afterwards. I also used Kings Hawaiian Rolls for the buns. We liked it! how many does this feed? i'm looking to make these for my league night and i need to feed 14-20 people roughly. There's 2 pounds of meat so I'd say 8 large sandwiches or 24 sliders. I used ground turkey. That makes it health food, right? Nothing more added, but found these terribly salty. Perhaps the velveeta, dogs at well. 1# of Velveeta is over 6500 mg of sodium. Breakfast sausage is loaded with sodium as well. I make my own Velveeta & use 2# of ground beef, which cuts the sodium by 2/3. Can this be made in advance...like the day before? I plan on including this recipe (among others) to feed 25 adults and plan on doubling the recipe. I work during the day, so everything will have to be made the day before...if not earlier. Any suggestions/help with regard to prep and serving will be greatly appreciated. Thank you! We cheated and used a can of cheese soup - it worked like a charm! Thanks for the recipe. My son and I love these. When I ask him to cook dinner before I get home from work, you can bet we are having these for dinner. Been making this mixture for 30 years now. However I use bagels and quarter top and bottom or by mini bagels, toast them for a few mins put the mixture on each bagel and put back in over for a few. I serve these as appetizers for new years, super bowls and holidays. Sounds yummy and it sounds a lot like queso dip. We make it here in Texas but serve it with tortilla chips. I know, I know then it's not a slider. I'll definitely try it as a slider and dice up some tomato, avocado and maybe some canned green chilies. Or hmm, would I feel too guilty if I put a little French's Onions on top? Nah..I'll risk it. I made these for the first time and mixed in some pork belly and topped with homemade pickles -- delicious! We make these a little differently; mix in mustard and ketchup and spoon onto mini rye bread. Bake for 10 minutes!